200% Bonus: Non-Funded Players Only. Offer valid once per player until further notice. Min dep. £5. Max bingo bonus £20. No code required. Wagering requirements: 2x Bonus & 2x Deposit. Bonus for bingo games only. Full T&Cs apply. 18+ only. 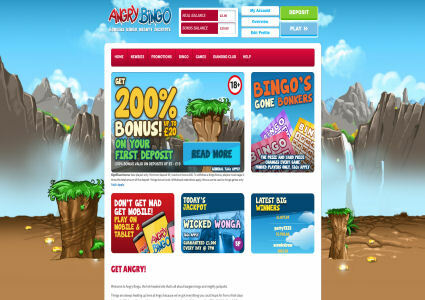 Angry Bingo was launched by the Mandalay Media group in July 2014. Mandalay is a name you may not be familiar with, but they are behind some of the biggest brands out there including City Bingo, Costa Bingo, and Sing Bingo to name but a few. We must admit when we first heard the name, we were a bit unsure about the brand, after all, bingo is all about fun and making people happy, right? Nevertheless, they have managed to pull it off by using cartoon graphics that are reminiscent of the Angry Birds game, an app that just about everyone has installed on their smartphones these days! The rest of the site looks great with bright and colourful graphics combined with a layout that is easy to navigate thanks to the drop down menus at the top of the screen. The rest of the home page is made up banners advertising their latest offers, promotions, the value of some of their jackpots and a list of their latest winners, and you can’t help but be impressed by some of the numbers on show. The blurb at the bottom of the page says “Welcome to Angry Bingo, the hot-headed site that’s all about free bingo and mighty jackpots!”, so let’s take a look and see of they can back this up. If you click on the ‘Join Now’ button in top right hand corner of the page, you will be taken to a short registration page where you are asked to enter the usual details including your name, address, email address and username. You will have to enter your credit or debit card details, but this is just to verify your age, and no money will be taken until you are ready to make a deposit. Angry Bingo will welcome you with a small amount of free money and if you like what you see and decide to fund your account, you will earn a bonus on every single deposit you make. Head into the lobby and you will find everything continues the cartoon styling, and the red and blue colour scheme looks great. 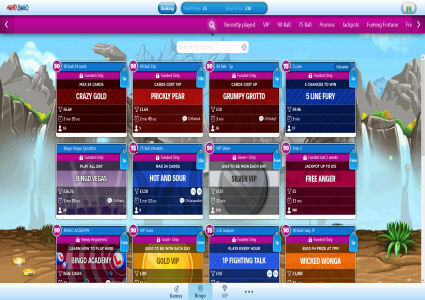 There are eight tabs to choose from including Free Bingo, Bonkers Bingo, Jackpots and Slots. Clicking on any other tabs will reveal a number of different rooms with card prices to suit all budgets, but some of these are for funded players only. If you fancy the slots, you don’t have to bother going through the bingo rooms as they have their own menu and all open up in a separate window. 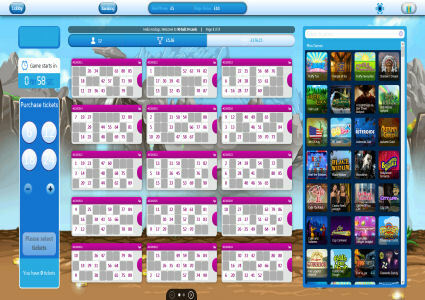 The rooms use the software’s normal layout, which you are sure to be familiar with as it used by literally dozens of different brands on the market. This is no bad thing though as everything has been honed to perfection with large portions of the screen being dedicated to showing your cards and enjoying a bit of banter with your buddies. 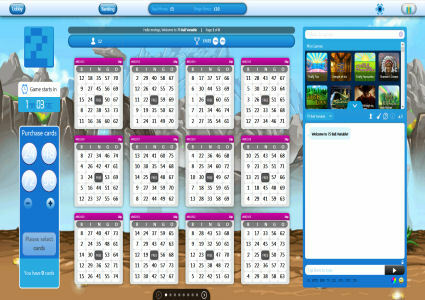 They have included enough options to keep things interesting and you can enjoy all of the instant games, slots and mini games without it interfering with your bingo play, although they do reduce the size of the chat room. With Angry Bingo being such a new site at the time of writing this review, we can forgive them for having a shortage of promotions. Nevertheless, they have managed to cram in plenty of free bingo, healthy bonuses and more than enough guaranteed jackpots to keep everyone happy. You can be pretty confident that these promotions will be built upon over the coming months though, as the Mandalay Media group has a history of running fantastic prize promotions, as can be seen by the rest of their sites. Angry Bingo is sure to be a success as they are following a tried and tested formula. The site looks great and has plenty to offer both old and new players alike, and you have nothing to lose by signing up and taking advantage of their no deposit bonus. You can access everything they have to offer on your mobile phone or tablet, so you can enjoy all of your favourite games even if the kids are using the computer for their homework. The only real obstacle facing Angry Bingo, is the fact that you can get exactly the same experience but with added perks by playing at some of the other Mandalay Media sites. Angry Bingo is powered by the popular Globalcom software and is home to both 75 ball and 90 ball bingo, and a great range of fun packed instant games and slots. The software is one of the best around and has been developed over many years and across numerous brands, making sure everything works well with the minimum of fuss. They have built plenty of useful options including a range of dauber shapes and colours and a handy auto buy facility, so you don’t have to miss any games when you go to make yourself a cuppa! In the chat room you will find the usual mix of emoticons and plenty of acronyms such as GL, WTG, 3TG, 2TG and 1TG, all designed to save you time and repetitive typing. You can alter the size and colour of the font which is really handy if you have poor eyesight, and you can lock down chat if you want to read the chat game rules before they vanish. One nice touch is the ability to purchase virtual gifts with your Loyalty Points, which you can then send to any of your bingo buddies or fellow roomies. Angry Bingo may be a new site but this does not mean they are scrimping on jackpots. Every day between 9am and midnight they host a beach party and give away a whopping £1,200. There are two rooms to choose from; 5p Beach Party and 10p Beach Party, each with its own guaranteed cash jackpots! From 9am until 11pm, there are 75 ball bingo games, each one complete with a £50 prize. The 10p Beach party games take place every two hours between 10am and midnight with a £100 prize pot; £50 for the full house, £30 for two lines and £20 for one line. If you are looking for bigger cash jackpots though, make sure you check out Angry Bingo’s pre-purchase specials. These take place every night at 9pm and there is a small fortune up for grabs. From the moment you register at Angry Bingo, you automatically become part of their Loyalty Scheme. For every £1 you add to your account you will receive 1,000 Angry Points. In addition to this though, you can pick up an extra 10,000 Angry Points for each friend that you refer that signs up and then goes on to fund their account. You can redeem your points at any time and you will receive £1 in bonus funds for every 1,000 you redeem. As Angry Bingo had only been open a week at the time of writing this review, we can forgive them for not having a vast array or promotions. Nevertheless, the promotions that they do have running are certainly impressive. In addition to this, Angry Bingo are hosting Samba Surprise games every hour from 9:15am until 5:15pm, and then every half hour right up until 11:45pm. You won’t find out the price of the cards or the prize you are playing for until the previous game has finished though. There will be all sorts of samba-tastic goodies up for grabs, including real cash, bonus cash, Angry Points and even tangible prizes!